I've gotten into silk scarves lately! I think they've got this nice vacation vibe and add a feminine touch to any outfit. But because I only really own two silk scarves at the moment, I've been trying to incorporate them into my looks in different ways. Here, I'm sharing some of my favorites. Knotting a silk scarf around the handle of a bag gives the piece a cute personality and a touch of uniqueness, don't you agree? This bag from X NIHILO is in a perfect tan color that goes with any outfit. But with the striped colorful silk scarf, it instantly looks like it is ready for spring! 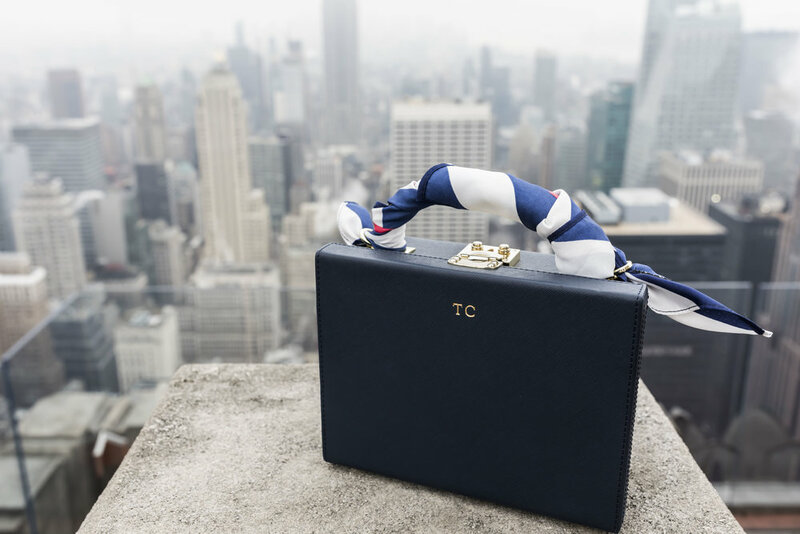 The bag is very spacious, making it the perfect piece to take with you on your next vacation, too. Wrapping a silk scarf around the top handle is like giving a bag new clothes to wear! This way of styling your bag is so easy but with great results. I love how my box bag transformed from "work" to "play" just like that! The silk scarf I'm using here is from Avon's Seaside Garden Collection. I used Avon's Seaside Garden Collection on my box bag from The Daily Edited. Of course, you know this one already, considering this is the most traditional way of wearing a silk scarf. Like wearing a statement necklace, tying a silk scarf around your neck enhances an outfit instantly. There is some pink in the silk scarf I have, so it works really well with a lot of my clothing pieces (because most of them are of that color family). But even with the simplest outfits, like a white t-shirt over jeans, for example, a silk scarf can easily spice up any look. 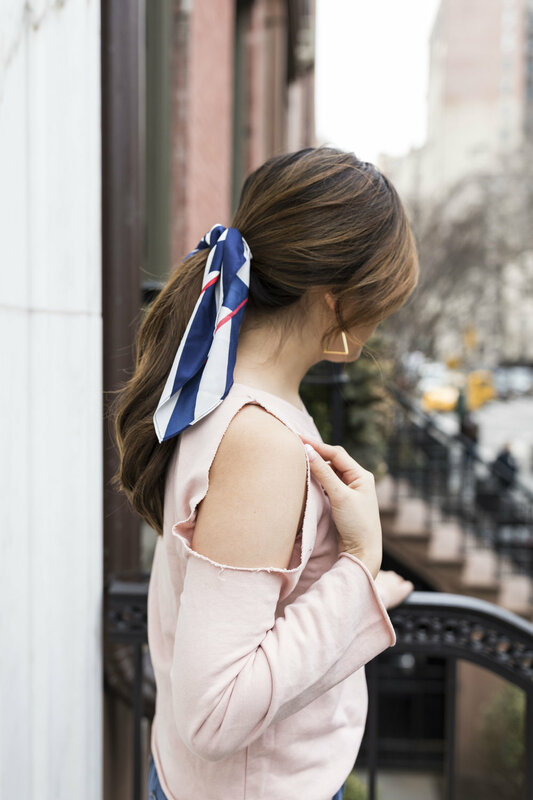 Let a silk scarf hang down your neck to create layers or your own collar. I added colors to my otherwise all-black outfit by tossing the silk scarf on, giving the overall look more dimension and texture. Imagine what you can do with all your office-suitable attire! Replace your belt with a silk scarf! The design is usually prettier and more colorful than a belt, anyway. So because I have a longer torso and shorter legs, I often go for high-waist pants or skirts to balance my proportion and lengthen my lower half. Sometimes, I like to highlight my waistline for the same reason, and adding a colorful silk scarf helps draw attention to my waistline. I would use a silk scarf as a headband if I could do it well, but I'm not skilled enough so it tends to slide off. Luckily, tying it over my hair tie when I have my hair up is not as difficult, so I did that instead! I love how this upgrades my hairstyle so easily, and with a nice touch of southern charm, too. I've tried it with a ponytail, as well as a bun and half updos, too, and they all look so elegant! Try these 6 ways out and let me know what you think! Thank you for reading!